Empowering professionals with online courses, classroom and onsite instruction, and the ability to share knowledge with other professionals. On behalf of the teams at Ecofy / VöC and Catoctin College, we are excited to introduce this new platform for you to improve your professional skills, as well as share your knowledge with others. Every week we add more courses and categories, and bring in more professionals who want to share knowledge about their industry and their expertise. In partnership with Ecofy, a coworking space located at 1899 L Street, NW in Washington, DC, Ecofy members receive discounts as well as free access to many of Catoctin's courses and events. 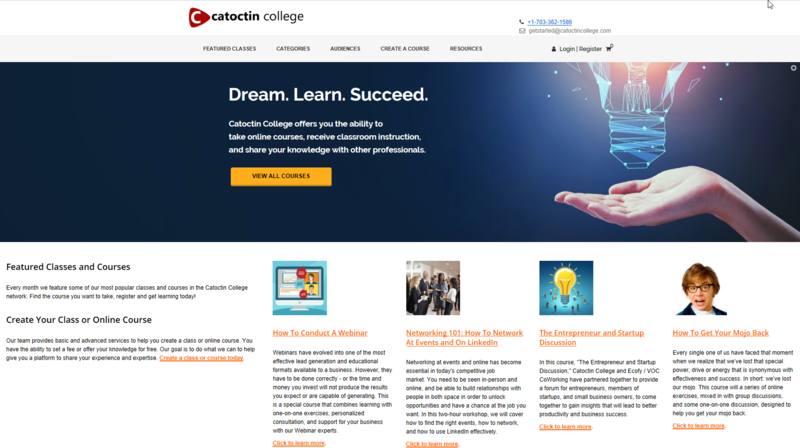 View the latest courses by visiting Catoctin College. You can view all courses currently available, or view the different audience pages to better find what you are interested in. Share your knowledge with other professionals or people who aspire to join your industry or profession. At Catoctin, we make the process easy. We help you build out your idea, and guide you through each step of the process. When your class is finished, we help promote your class to your desired audience. You have the option to offer your class for free, charge a small fee, or set-up your own boot camp for a premium. Creating a class is a great way to showcase yourself as a thought-leader, promote your business, or just help mentor others. Click to learn more about creating a class. Another service available with Catoctin is the ability to receive personalized training and classes. Many courses come with dedicated hours of direct, one-on-one consulting and support. Another option is to request a class you see in our course catalog be personalized for you, your team, or your entire company. Just let us know, and we can build a program to meet your needs! Who Is Ecofy / VöC? Ecofy / VöC is an Ecosystem as a Service (EaaS) with a coworking space at 1899 L Street, NW, 4th Floor, Washington, DC 20036. We support cannabis and hemp businesses by providing a space to work, business software, events, classroom and online education, and business consulting to help professionals succeed in this rapidly growing industry.